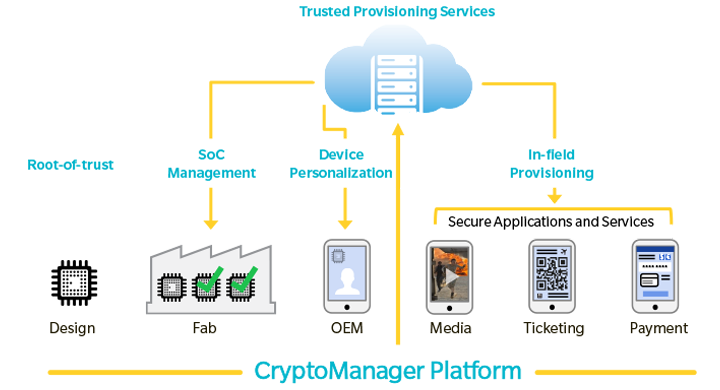 From chip management to device personalization to downstream feature provisioning, the CryptoManager security platform creates a trusted path from the SoC manufacturing supply chain to downstream service providers with a complete silicon-to-cloud security solution. The demand for trusted applications on mobile and IoT devices is on the rise. As the amount of valuable data housed and communicated across mobile and Internet of Things (IoT) devices continues to grow, the need for robust, complete lifecycle device security becomes increasingly important. However, establishing and maintaining trust across an increasingly fragmented ecosystem has proven to be a daunting task. The CryptoManager security platform is complete silicon-to-cloud solution for the distribution and authentication of cryptographic keys throughout the lifecycle of a device ? enabling dynamic SoC management and device personalization in the supply chain, and securing applications and services through in-field key provisioning. The CryptoManager platform includes a Security Engine, which is a flexible root-of-trust implemented as hardware or software, for secure provisioning, configuration, keying and authentication throughout the lifecycle of a device. A local and cloud-based CryptoManager Infrastructure and Trusted Provisioning Services support the Security Engine, providing chipmakers, device OEMs, secure application developers and service providers a scalable and flexible trust management solution.